There’s a good reason Seattle is often referred to as the “Emerald City,” it’s surrounded by water, including Lake Washington, the Puget Sound, Lake Union and countless smaller lakes, as well as lush greenery all year round. Then, there are the mountains that can be seen in every direction: the Cascades to the east, the Olympics to the west, with Mount Rainier looming over it all. Those who own Seattle waterfront real estate enjoy having a wealth of outdoor activities at their door, including kayaking, canoeing, paddle boarding, sailing and just about anything you can dream up on the water. It’s also a city that’s very bike-friendly with a number of new “biker only” lanes painted bright green for commuters as well as the 27-mile Burke-Gilman Trail for cycling, walking and jogging. Seattle waterfront real estate owners also enjoy easy access to a wealth of attractions the city is renowned for, from the iconic Pike Place Market, one of the oldest farmers markets in the country, to the Pacific Science Center, numerous live theater productions and much more. Seattle is also known for its thriving food scene, which includes everything from tasty, cheap eats from food trucks to high-end cuisine at fine dining restaurants. When looking for Seattle waterfront real estate, you’ll discover a wide range of options throughout the region, with many communities featuring waterfront homes ranging from houseboats and lakeside cottages to luxurious estates. You’ll find many of those homes on Lake Washington, where your neighbors will include pro athletes from the Seattle Mariners and the Seahawks and executives from companies like Microsoft, Amazon and Starbucks. There are also waterfront homes on the Puget Sound, which have an ocean beach feel, as well as Lake Union and a number of smaller lakes. For those who want to enjoy the best of urban amenities and a lifestyle on the water, Seattle waterfront real estate is hard to beat. 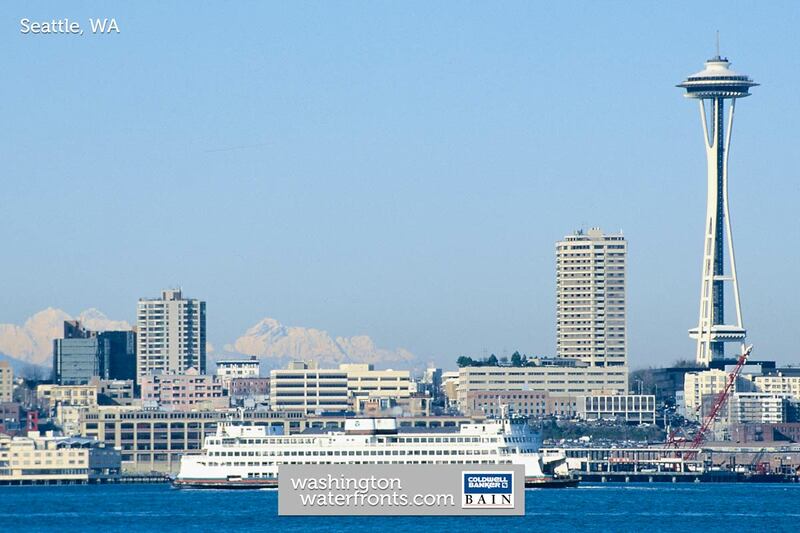 Downtown Seattle waterfront real estate primarily includes condos and apartments that enjoy sweeping Puget Sound and Olympic Mountain views, while providing the opportunity to be in the heart of everything the “Emerald City” offers. Not only will you be able to enjoy watching the ships and boats glide across the water, but easy access to a wealth of recreational activities on the water and on land. Kayaking, paddle boarding and sailing are all popular here, as well as walking or jogging along the waterfront. This very bike-friendly city offers biker-only lanes for commuters, and you’ll have easy access to the 26-mile Burke-Gilman Trail too. Just a short drive away you’ll find countless lakes as well as soaring mountains with miles and miles of scenic hiking trails. Of course, many enjoy living in the heart of downtown for access to major employers as well as the chance to be just a short distance from famed Pike Place Market. One of the nation’s oldest farmers’ markets is popular with visitors and locals alike, making it easy to pick up fresh flowers, produce, seafood and so much more, right on your way home. Just minutes from your front door you’ll find a long list of cultural attractions from art galleries and concert venues to live theater and museums. More than 6,000 restaurants are located in Seattle, including lots of farm-to-table options, from great eats at food trucks to incredible dishes utilizing the Northwest’s high-quality ingredients at fine dining restaurants. Worried about the rain? The reality is Seattle doesn’t rank as one of the nation’s wettest cities - most of the time the weather is rather mild and summers are out of this world. Downtown Seattle waterfront real estate typically offers some fantastic options, including condos tucked between Pike Place Market and Elliott Bay waterfront. Take advantage of our industry-leading tools to make your property search as easy as possible and be sure to register for a FREE account so that you can receive email alerts whenever new Seattle waterfront real estate for sale hits the market. If you're seeking to sell your Seattle waterfront property, contact our Waterfront Specialists directly for a comprehensive listing analysis and to learn more about the cutting-edge marketing strategies we'll use to sell your home quickly for top dollar!